Why would I need self storage in Gig Harbor, WA? There are a variety of reasons why you might need self-storage in Gig Harbor, WA. How much is a storage unit in Gig Harbor, WA? The cheapest storage unit in Gig Harbor, WA is $39.00 per month. What size storage units do you have available in Gig Harbor, WA? In Gig Harbor, WA we have sizes that range from 3'x5' to 5'x5' to suit your storage needs. How much is it for a 3'x5' storage unit in Gig Harbor, WA? The cheapest 3'x5' storage unit in Gig Harbor, WA is $39.00 per month. Gig Harbor is a small city on the shores of Washington's Puget Sound. It's among one of the more popular tourist destinations in the area, attracting visitors with its historical waterfront village and proximity to a number of state parks. Gig Harbor is one of the communities that's considered part of the "Gateway to the Olympic Peninsula." Native American tribes were the first to call Gig Harbor home, recognizing the value of its thriving flora and fauna. Settlers discovered scenic Gig Harbor in 1840, but the city did not incorporate until nearly 100 years later. Commercial fishing and other maritime pursuits formed the foundation of its economy, even in the early years, though farming, livestock and lumber also served to boost trade in the area. When a bridge that connected Gig Harbor with many of its neighboring cities was completed in the 1950s, the area began to quickly develop. It evolved into a major suburb of Tacoma and saw significant residential development followed by commercial growth. 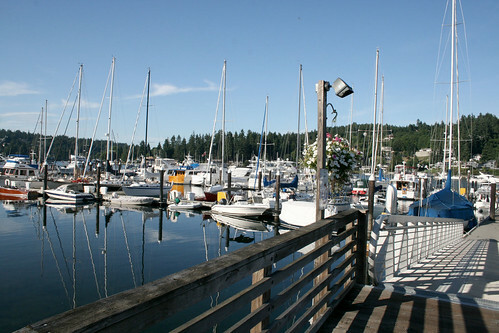 Gig Harbor was named after a longboat, called a "captain's gig," that early settlers used to reach Gig Harbor. The Gig Harbor area consistently lands on best-of lists for places to live in and retire to. In addition to its many everyday amenities and comfortable residential communities, the city offers plenty to see and do. It offers the picturesque harbor, which sees plentiful boat traffic all year long, as well as abundant green space throughout the city. You'll also find shopping and dining destinations galore. Since tourism serves as a significant portion of Gig Harbor's economy, the population changes throughout the year as people arrive and depart on vacation. You can learn more about the city's history by visiting the Harbor History Museum, which chronicles the early years of Gig Harbor's development and pays homage to the city's roots. Several historical sites are scattered throughout the township, including preserved agricultural buildings. There are nine public parks within the city limits, and several state parks are within easy driving distance, so you'll never lack for outdoor activities. Peninsula School District serves Gig Harbor students and schools. In addition to standard academics, the school district offers career and technical education courses. There are many private schools in the area as well, primarily Catholic and other Christian campuses. Utilities: Peninsula Light Co., Gig Harbor Utilities and Puget Sound Energy are the community's primary utilities providers. Garbage and Recycling: Murrey's American Disposal provides collection services for the residential communities of Gig Harbor. Transportation: Pierce Transit operates a route through the city of Gig Harbor. As Gig Harbor becomes an increasingly desirable place to live, home prices have been on the rise. However, it still remains considerably more affordable than its big-city neighbor, Seattle. Gig Harbor homes often offer scenic forest or waterfront views, and many are situated on spacious, grassy lots. In addition to existing real estate, there's new construction happening throughout many parts of the city. Our lowest priced units in Gig Harbor, WA average $39.00 per month. 47 people have reserved units in Gig Harbor, WA in the past 30 days. There is 1 location within Gig Harbor, WA's city limits.